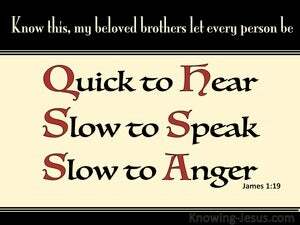 James was a half-brother of the Lord Jesus and could have boasted of their close family relationship or identified himself as a great leader of the Christian church. 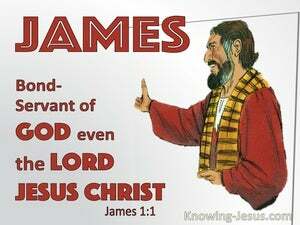 He was chairman of the Jerusalem council, which started to lay the foundational doctrines of Christianity, but James does not boast his parentage, position or pedigree.. but identified himself as a bondservant of God - a slave of the Lord Jesus Christ. Many believers think that our Christian life should be problem-free and devoid of trials and yet Jesus warned that in this world we will have tribulation, while Paul also reminds us that we must, through much tribulation enter into the kingdom of God. 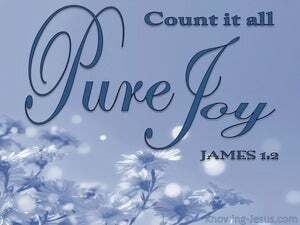 Whether we are faced with fleshly temptations that rise up from our old sin nature or testing trials that come from above, we know that God takes all things and weaves them beautifully together for good to those that love God and are called by grace through faith in Christ - according to His good purpose. 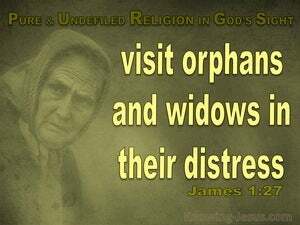 The epistle of James was sent to Christians who had been scattered abroad as a result of persecution. 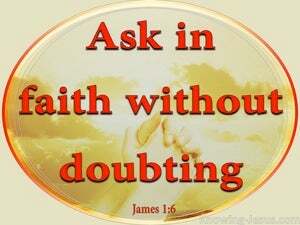 He knew that the human response to the difficulties and dangers we face in life can either cause us to doubt God's goodness or increase our trust in His sufficient grace. We are told in Hebrews that without faith it is impossible to please God, for not only must we 1) first.. trust Him for salvation by grace through faith in Christ's finished work at Calvary, but 2) second.. as born-again Christians we must continue to believe in the truth of His word.. to trust in His many precious promises and to have faith that He hears and answers prayer. 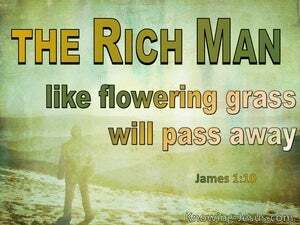 There is much in Scripture that talks of money and wealth. 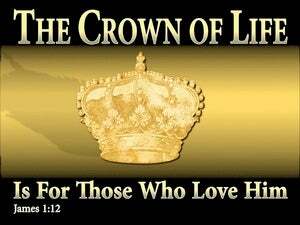 We are not to store up riches on earth but to lay up treasure in heaven. 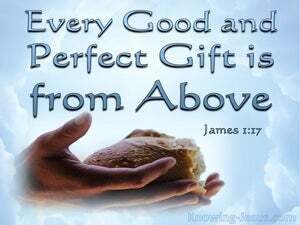 We are exhorted to fix our hope on God Who supplies all things lavishly for us to enjoy. 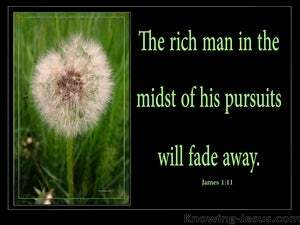 We are to not to place our trust in the uncertainty of this world’s fleeting affluence, but in God’s eternal promises to us. 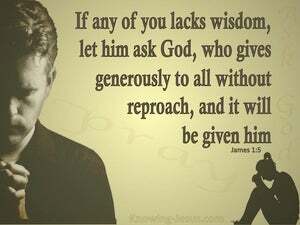 As with all the apostles, the dear desire of James is to see all believers in Christ maturing in their faith; growing in grace; trusting God unwaveringly and developing an ever-increasing faith in His gracious provision and sufficient grace. 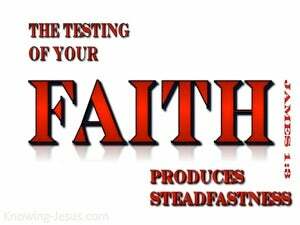 And yet he knows from experience that the Christian life, for both rich and poor, is full of trials and tribulations - difficulties and distresses. 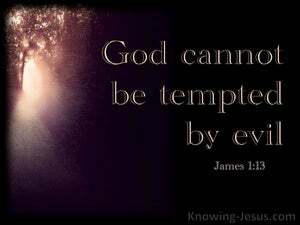 When we are tempted to sin we must not forget that temptation never comes from the Lord, but has its root in sin. 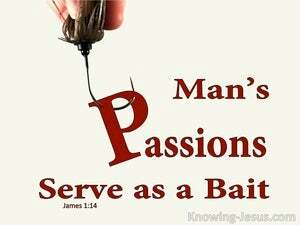 Temptation comes to us through the outer enticements of the world and the inner lusts of the flesh. If we give into temptation we sin, but when we resist sin's evil bait.. God turns that temptation into a meaningful trial, which He uses for our greater good and His own glory. 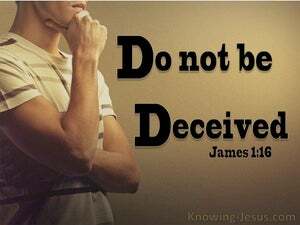 We are warned in many places in Scripture not to be deceived.. especially in the area of testing, trials and temptation. 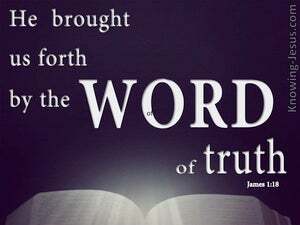 We are not to be deceived about the source of sin and its consequences and we are to be particularly careful of being led astray from the truth of God's word into justifying our own, self-authenticated, ungodly acts and lustful pride.. rather than taking personal responsibility for our own words and actions. God is good, and in the beginning, He created the visible light of the sun, and the moon, and all the heavenly bodies, for warmth and heat and to brighten our pathway on earth. But He is the same One Who illuminates our spiritual understanding for His Word is a lamp to our feet and a light to our path - and through His Holy Spirit we are guided into all truth. 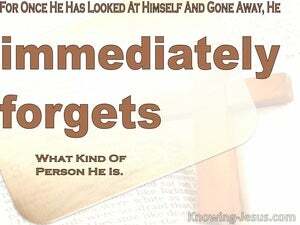 In the beginning God created man in His own image, but man rebelled and all his progeny were imputed with sin. 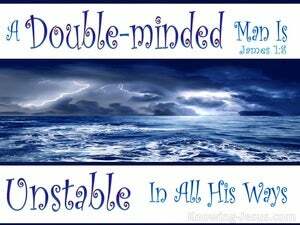 They became sinners by nature, estranged from God and without hope in the world. Too often in life we discover the folly of opening our mouth and responding in careless haste to the words and actions of others and too often we react in annoyance or anger, only to discover that we had misunderstood the facts of the matter, causing us to regret that we spoke so quickly and reacted so hastily. 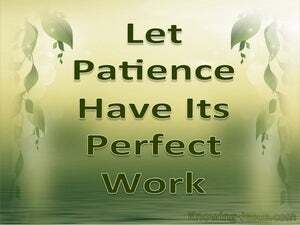 In his epistle James outlines the relationship between faith and works. 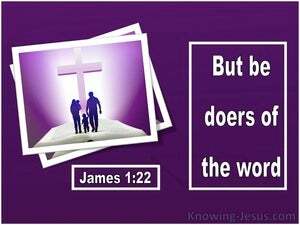 He recognises that there are some that profess to be Christians who do not have a saving faith - but he is also aware that there are those that have a genuine saving faith but show little or no outward evidence of their justification - and so he admonishes all genuine Christians to be doers of the word and not hearers only. 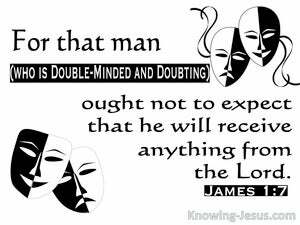 Not a day should go past without the believer in Christ checking him or herself to make sure that they are in the faith and not tossed about by every doctrinal ‘wind-of-change’. 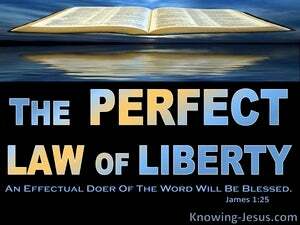 There should be a regular examination of one’s biblical principles to ensure that we are not straying from the path of righteousness, becoming embroiled in legalist practices or claiming that our liberty in Christ is a licence to sin. There is a saying that: “Christianity is a relationship and not a religion', and in many respects this it true, but perhaps it would be more accurate to state what the Bible says - that Christianity is: the only pure and undefiled religion in the sight of our God and Father.